After becoming fluent with addition facts the best way for students to retain the knowledge of those facts is by doing addition computation. 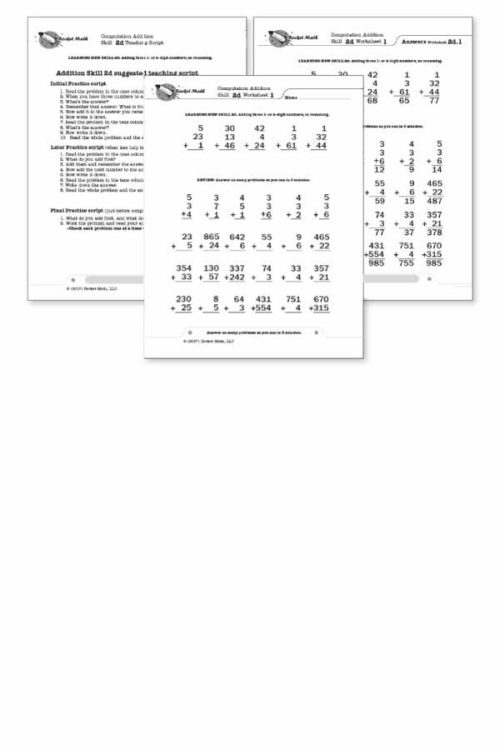 If students have not been taught addition computation, this program breaks it down into small, easy-to-learn steps that are numbered in a teaching sequence that leaves nothing to chance. Note that the number for each skill gives the grade level as well as indicating the teaching sequence. Skill 2a is a 2nd grade skill and after skill 2f is learned the next in the sequence is skill 3a. The sequence of skills is drawn from M. Stein, D. Kinder, J. Silbert, and D. W. Carnine, (2006) Designing Effective Mathematics Instruction: A Direct Instruction Approach (4th Edition) Pearson Education: Columbus, OH. For each skill there is a suggested Teaching Script giving the teacher/tutor/parent consistent (across all the skills we use the same explanation) language of instruction on how to do the skill. The script helps walk the student through the computation process. 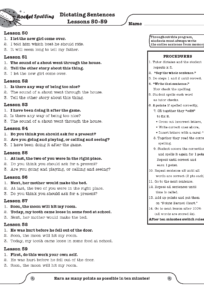 For the teacher, in addition to the script, there are answer keys for the five worksheets provided for each skill. 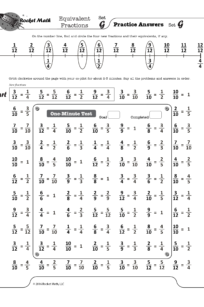 Each worksheet is composed of two parts. The top has examples of the skill being learned that can be worked by following the script. After working through those examples with the teacher the student is then asked to work some review problems of addition problems that are already known. The student is asked to do as many as possible in 3 minutes—a kind of sprint. If all is well the student should be able to do all the problems or nearly all of them, but finishing is not required. Three minutes of review is sufficient for one day. 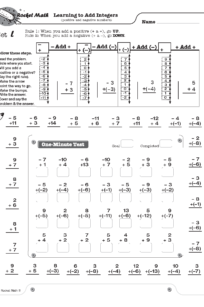 There are five worksheets for each skill. Gradually as the student learns the skill the teacher/tutor/parent can provide progressively less help and the student should be able to do the problems without any guidance by the end of the five worksheets. There are suggestions for how to give less help in the teaching scripts. With everyone’s initial order of Wall Charts we send 4 sheets of star stickers (over 750) for each Wall Chart ordered. 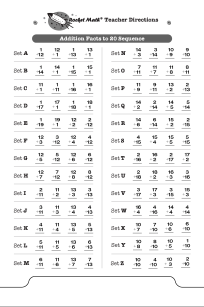 But what if your school has somehow run out of star stickers for the Rocket Math Wall Charts? 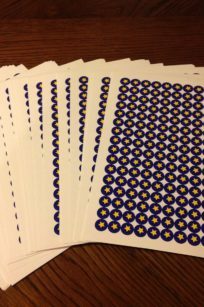 Order Item #2007 and we will send you 40 additional sheets of star stickers–over 7,500 stickers. We include 4 removable, and reusable Goal Arrows with each Wall Chart. These stick to the Wall Chart to set motivating goals for your students. If your school needs Goal Arrows or additional Goal Arrows, here’s how to get them. 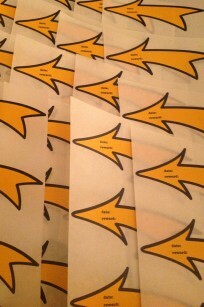 Order Item 2008 and we will send you 48 additional arrows–enough for 16 teachers. Learning to Add Integers displays problems on a vertical number line and then teaches students two rules about how to solve problems that add positive and negative numbers. Rule 1: When you add a positive number, go UP. Rule 2: When you add a negative number, go DOWN. Doing problems on the vertical number line is more intuitively appealing because UP is more and DOWN is always less. This makes crossing zero a little easier to comprehend. Students learn how these two rules play out with two types of problems: when starting with a positive number and when starting with a negative number. Students gradually learn all four types of problems. On each worksheet they see how to solve each problem type using the number line working with their partner. Then students learn to recognize the pattern of each problem type by orally answering several examples of each type with their partner (going around the outside of the page). You will probably not be surprised that there is a one-minute test on each set. Students are to be 100% accurate and to meet or beat their goal from the special writing speed test for Learning to Add integers (the fastest goal is only 28 problems in a minute). 4 online lessons teach students how each type of problem is solved and why it is correct.